Q: Hi Dr. Dana and Katie! I love the Top 10 posts, and I’m wondering what your Top 10 favorite blog posts are? A blog post about this blog? Whoa, things are about to get super-duper metaphysical. But we’re game! In order to tackle this challenge, Katie and I each picked our top 5 favorite posts and commented on them. With 5 years and 463 posts to chose from, it was tough. But, as we soon discovered, sometimes it was a childhood memory, or a behind-the-scenes, that actually made the post one of our favorites. Dr. Dana: I have a lot of affection for this post because it is my VERY first one. August 13th, 2013. For years, people had been asking me to find a way to share my creative projects and programs (there was even person who suggested I get my own TV show…hmmmm). It was Katie who started whispering You should blooooog in my ear. I agreed to try it, not realizing that this blog basically adds a part-time job on to my already full-time job. I will get even with her. Someday. 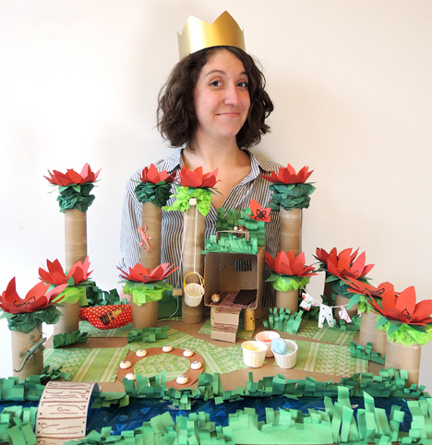 Katie: I remember the first time I suggested a blog about all things Cotsen, Dr. Dana and I were crafting a Tiger Tales project and fielding questions about what we were building from an inquisitive parent. I think my comment went something like, “It’s easy! 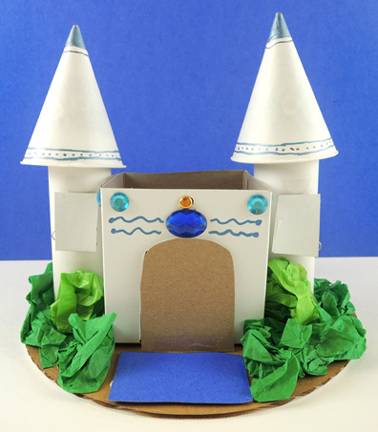 Just take a few pictures of the project, explain how to put it together, and BAM! 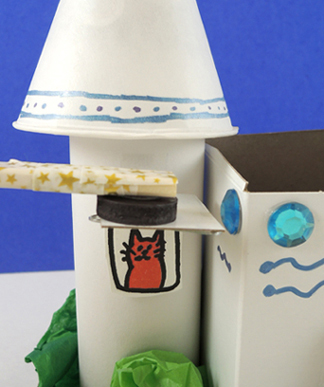 You’re done!” So maybe it wasn’t going to be that easy, and maybe it has added a few grey hairs on Dr. Dana’s head, but the blog has certainly delivered creative literacy magic across the globe. Katie: When Dr. Dana said we were going to head to her house to take pictures and/or video of her in the shower while she tested a product for the blog, I was totally up for it. What I did not realize was how I was going to have to restrain myself from laughing when she was in the shower and what ensued while she was there. You may hear me chuckle a bit and see the camera move, but the video did not show me nearly collapsing onto the tiled floor in laughter after I stopped recording. Hilarious. 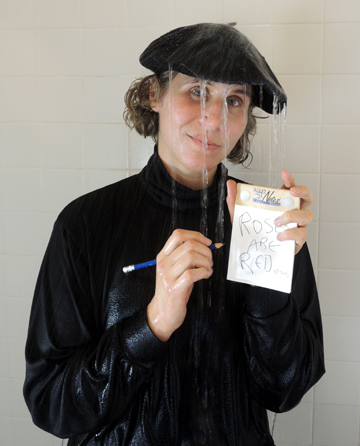 Dr. Dana: Yup, writing poetry in the shower whilst wearing a soaking wet beret was one of those “Huh. First time in my life I’ve ever done this” moments. Which seems to happen ALL THE TIME on this job. 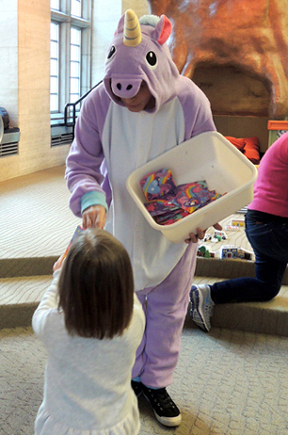 Katie: One of the reasons I applied to work at Cotsen was because the job description specifically stated that applicants would be asked to wear a costume. I’ve worn many a costume during my tenure at Cotsen and transformed myself into fun characters: a renaissance princess, a steampunk spelunker, Charmander, a car mechanic, a Potter-esqe witch. I think dressing as a medieval herald is one of my favorites. The tights were super comfy. 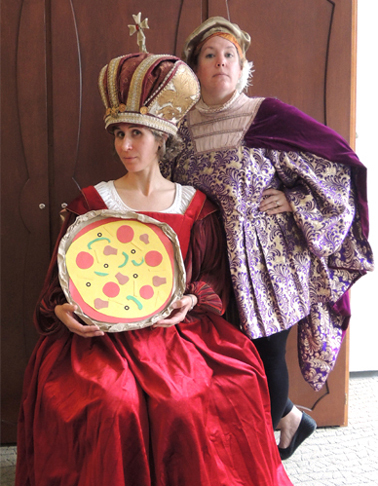 Dr. Dana: All in my orbit must enter the costuming vortex! Mwah hah hah! 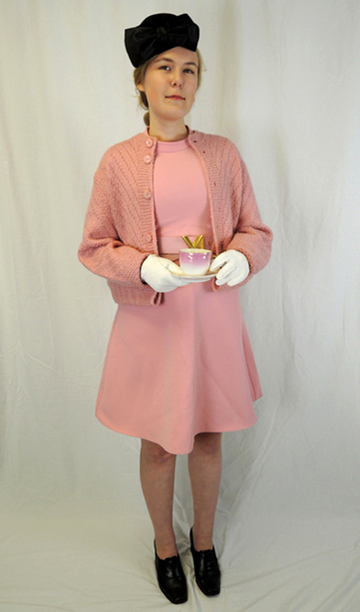 And hey…who wants to see Katie as Eloise? #6 CAN YOU DIG IT? 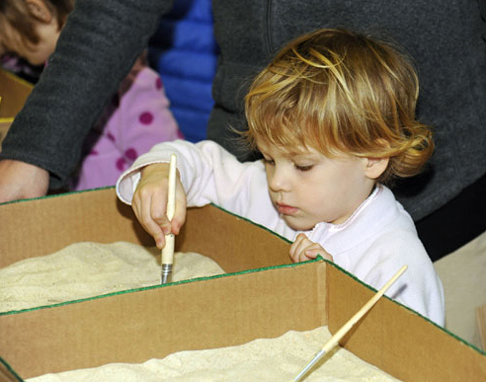 Dr. Dana: This was an archeological dig we designed for a Journey to the Centre of the Earth event in 2013. 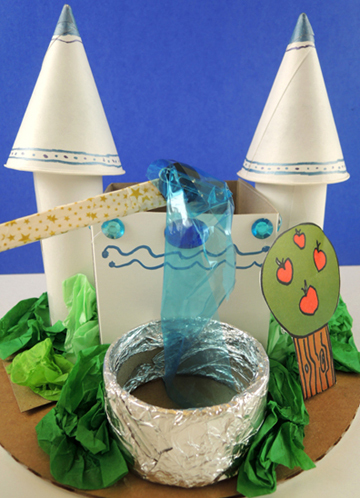 We really wanted to do this activity, but there were so many challenges. How do we replicate an actual dig? 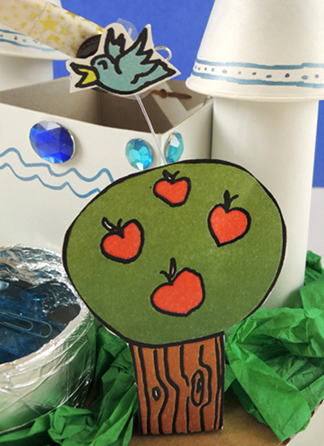 How do we tie the concepts together in a way that allows kids to self-discover? How do we make this thing portable? How do we keep it hygienic? How can we produce it fairly cheaply? The results were a total home run. Katie: We estimate that 5,000 people attended this event. Along with being able to participate in an archaeological dig, learn about spelunking, climb a inflatable mountain, meet nocturnal animals and play music on rocks, those who were brave enough got to meet a baby Tyrannosaurus Rex! 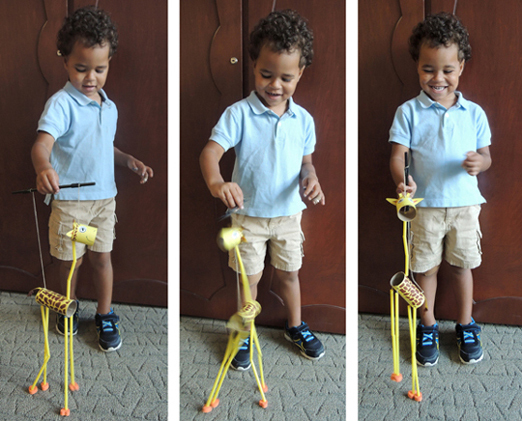 Katie: Figuring out how to make a giraffe puppet with dancing legs and a moveable neck was tough. Really tough. 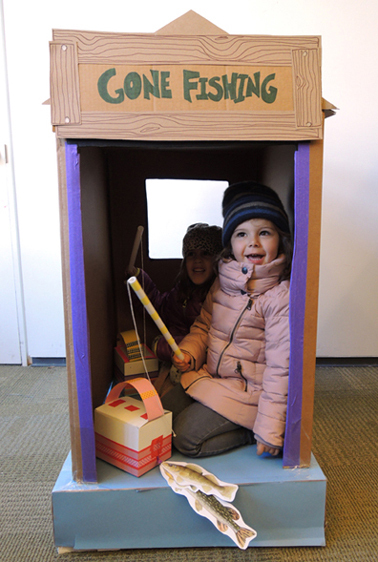 Dr. Dana and I went through at least a dozen ideas and templates before we struck gold using cut straws, string and toilet paper tubes. I still have the giraffe we created hanging in my conference room office. I’m pretty proud of that little dancing giraffe. He’s quite adorable, too. 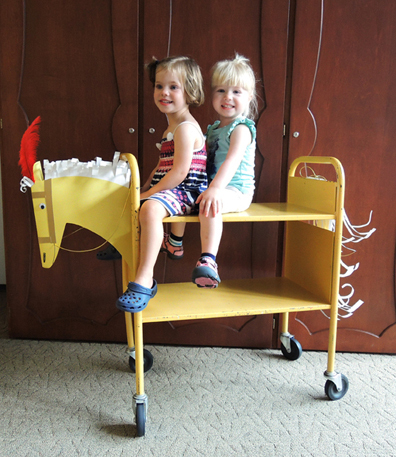 Dr. Dana: At one point, Katie and I were madly designing separate giraffe prototypes, grinding our teeth in frustration. In the end, Katie had the winner. The giraffe really dances! Dr. Dana: My specialty is unusual takes on literacy, and I think this was one of my finest moments. I challenged a Princeton University student designer to costume as many literary characters as he could in 180 minutes, using ONLY what he found in our locally-owned thrift and consignment store. 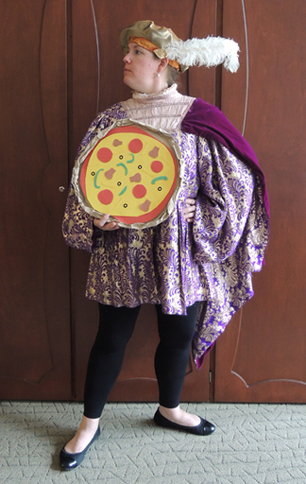 My only regret was that we ran out of time before I could be dressed as Mrs. Whatsit. Katie: Mad props to the Princeton University students who were willing to stuff their feet into shoes that were several sizes too small. And salad forks as crystal daggers? Brilliant. Dr. Dana: As a horse-obsessed little kid, I was constantly building show jumping courses, which I would then jump over, endlessly. This project allowed me to revisit those happy memories, and I was surprised at how deeply touching it was. Also, the video! The cheers when the little girl recovers from her misstep over the last combination? Awesome. Katie: This is the perfect time for me to introduce an often used phrase in our office: LID. Leave It Dana. 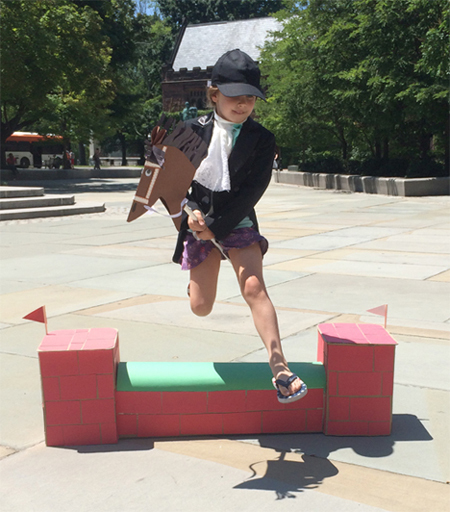 She wanted to create an elaborate jumping course and I had to constantly remind her about our young audience. LID. 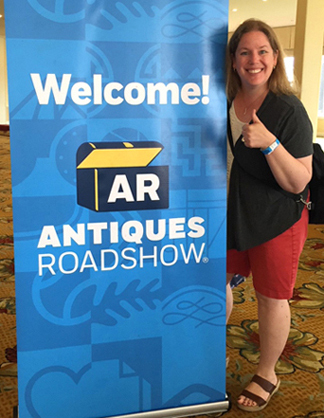 Katie: This was a once in a lifetime opportunity to be a part of the PBS ANTIQUES ROADSHOW! I was lucky enough to spend a long weekend hanging out with my younger brother, I got to meet my favorite ROADSHOW appraiser, and I learned what some of my inherited treasures are worth. PBS is currently airing the episodes of the San Diego ROADSHOW, so tune in and see if you can spot me in the crowds! Dr. Dana: Well, I was on Channel 20’s WOW when I was a little kid. Anyone? Anyone? Dr. Dana: Marissa is amazing on so many levels. How can she NOT be on this list? Katie: Yup. What Dr. Dana said. Katie: I was living in Belgium when Tiger Tales kids were creating gingerbread houses and chasing an enormous cookie that looked strangely like Dr. Dana across campus, but this project still tickles my funny bone. From our apartment across the Atlantic, my son and I watched the accompanying video and we both went into hysterics when Dr. “Gingerbread Girl” Dana did her little hop and started running away from the excited kids. It takes a confident cookie to dress up like one. Dr. Dana: This story time definitely ranks as one my favorites of all time. 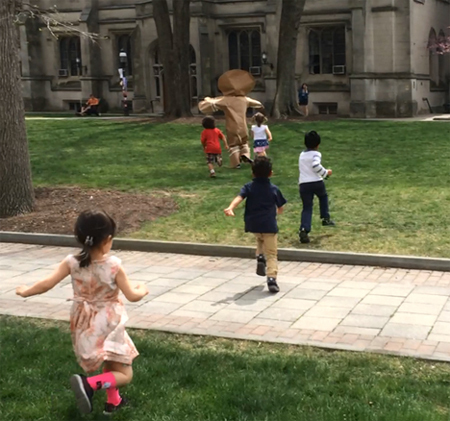 I distinctly remember running away from the kids, giggling madly, thinking: “I have a Ph.D., I’m dressed like a giant cookie, I’m being chased by kids on an Ivy League campus.” Life is sweet! Katie is once again off on wild adventures. Remember that time she spent a year in Europe? Or how about when she dropped by Antiques Roadshow? 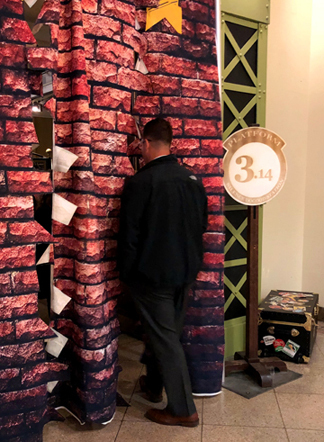 This time, Katie journeyed to the Franklin Institute for a veeeeeery special Harry Potter event. Take it away, Katie! It’s universally understood the Harry Potter series has captured the hearts of children, but adults are just as passionate about Harry and his adventures at Hogwarts. 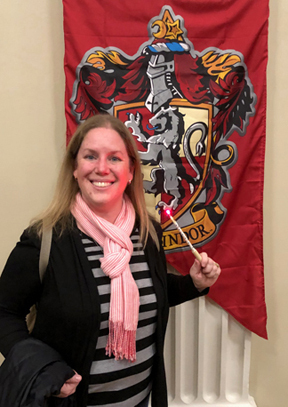 I count myself as one of those adults who is a Harry Potter fanatic, so naturally I leapt at the opportunity to attend Wizard School, an after-hours adult only program held at the Franklin Institute in Philadelphia. The Franklin Institute is one of the oldest museums in the United States dedicated to science education and research, and it is absolutely one of my favorite places to take my son when we have a free day. 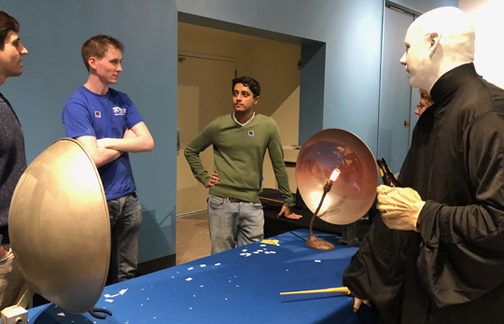 Named after Benjamin Franklin, the Franklin Institute has four floors of amazing science exhibitions, a planetarium, IMAX theatre, and even a telescope observatory on the roof. 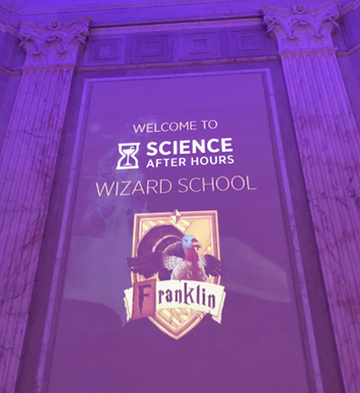 Science After Hours is a series of events the Franklin Institute holds for adults 21+ and is designed around a specific theme, like Wizard School, with demonstrations, live speakers, music and dancing, activities, a chance to explore the entire museum at night, and…a cash bar. As soon as I arrived, I snagged a cup of Butter Beer and started wandering through the museum to various activity tables. 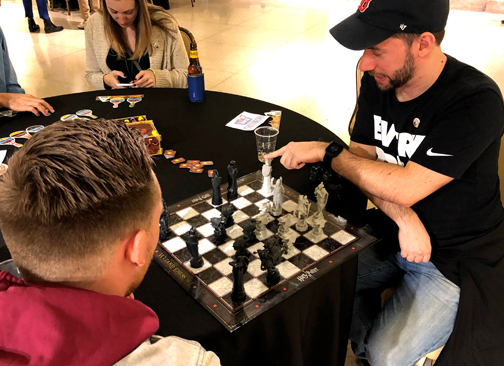 Wizard’s Chess anyone? In the Giant Heart exhibit, I tested to see if I was a pure blood by pouring a glass of clear liquid into a second glass of clear liquid. If the mixture turned red, you were a pure blood. If it didn’t, you were a Muggle. 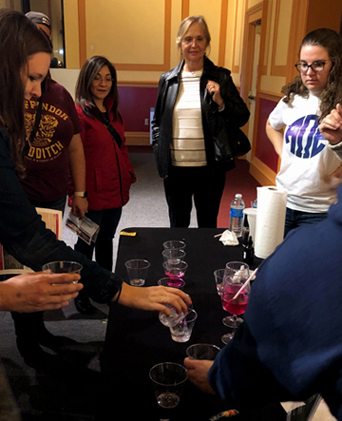 The magic is a pH indicator, phenolphthalein, being mixed with water and reacting to sodium carbonate, which is present in the second glass. The sodium carbonate and phenolphthalein react and turn the liquid red. If one glass didn’t have the chemical, the liquid remained clear. My glass turned red – I’m a pure blood witch! I made my way past a very long line of people waiting to make a magical amulet so I could watch part of the Raptores Maximus show. Mike Dupuy, a local falconer and educator, introduced several of his birds of prey. 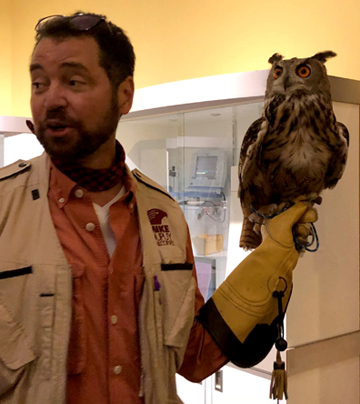 Including Mr. Big Owl, a Eurasian owl who had the most stunning orange eyes. Next, I journeyed on to Pepper Hall, where I was greeted by 2 very long lines: 1) Make your own wand; and 2) Visit the Slimy Serpent, Critter, and Creature Magic Supply Shoppe. The Supply Shoppe was a tremendous display of potions ingredients and various critters you may discover as a student at Hogwarts, including snakes, spiders, frogs and even a jar of leeches. 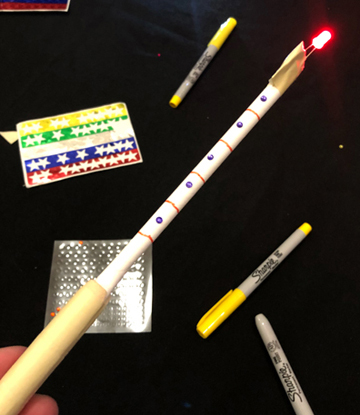 But I opted for wand making because I was curious to see how the Franklin Institute would handle a wand craft for well over a thousand people after our experience with our much smaller Wand Works event. 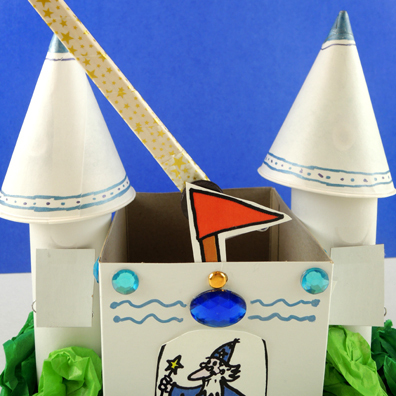 The wand craft was impressively simple, but quite impactful. 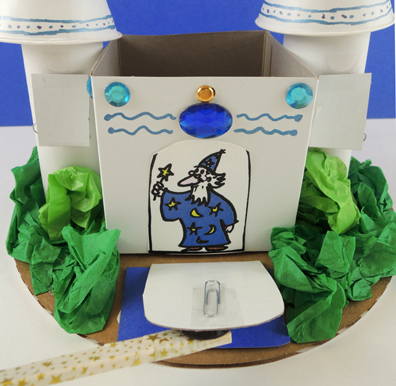 As you approached the front of the line, you selected a colored light bulb with wire legs (identical to the bulbs we tested in the Circuit Clay kit). 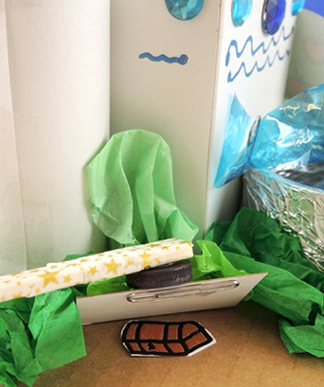 You moved forward and were given a small button cell battery and a paper straw that had been cut on one end to provide a slit for the battery to rest. Volunteers demonstrated how to slide the two legs of the bulb onto each side of the battery, illuminating the bulb, and then gave you two pieces of tape to secure the bulb onto the battery and secure the battery into the slit at the top of your straw. 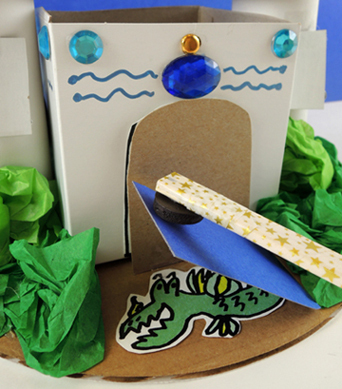 The final step was a wood clothespin, which is where you insert the paper straw. 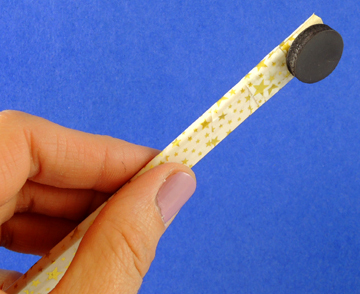 The clothespin is wrapped with more tape to keep the straw from falling out and becomes the handle of the wand. 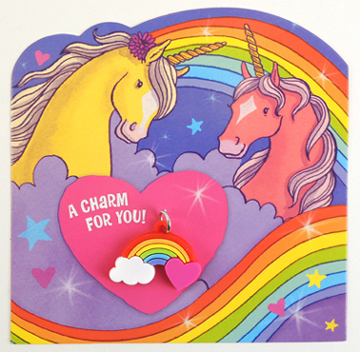 After the wand is complete, there were tables with markers, star stickers and tiny jewels to bedazzle your wand. No two wands were alike! I tried to attend a presentation called The Absolutely True Fake Story of the Philosopher’s Stone. I should have used an Apparition spell to get me to the theater faster because the seats were full by the time I arrived. Not deterred, I walked through Platform 3.14 to see the Hogwarts Express (cleverly disguised as a Baldwin 60000 locomotive engine, which is on permanent display in the Train Factory exhibit). Many of the demonstration tables had student volunteers from nearby colleges, including Drexel University, Temple University, and the University of Pennsylvania. The students were enthusiastically full of scientific information – such as the possibility of real-life invisibility cloaks (i.e. lasers and thermal imaging cameras). They were ready to be peppered with questions from everyone. Including Voldemort. 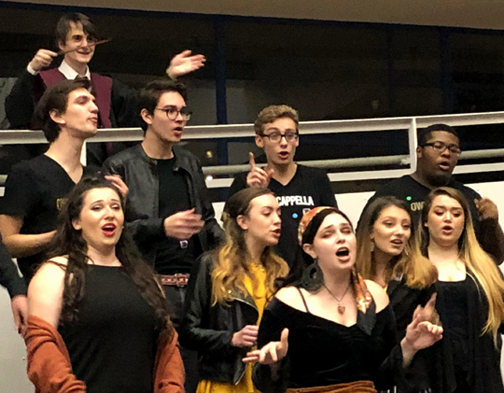 The OwlCapella group from Temple University was serenading those in the ticketing atrium who had paused to rest their feet or have a snack, and I got a good laugh when I noticed Harry Potter conducting, unbeknownst to the choir. Total Potterbomb. The grand finale was held in the Franklin Memorial Hall, in front of a giant statue of Benjamin Franklin. Everyone was asked to raise their newly made wands and chant the Incendio spell. The result was a mighty green fireball explosion, courtesy of about a dozen large balloons filled with hydrogen. Very cool. And just in case you’re wondering, Dr. Dana has ignited giant fireballs in the name of wizardry as well. You’ll find that here. 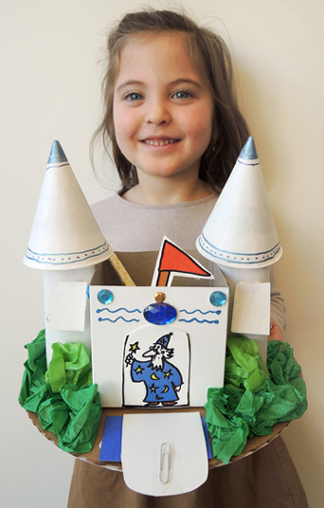 Wizard School was so popular, the Franklin Institute added a second date at the end of November! Dr. Dana and I are eagerly awaiting the Science After Hours schedule for 2019 with hopes there will be another literary related evening for us to enjoy. Stay tuned!